The reputation of Toshiba rests on the effectiveness of its after-sales service provided by Toshiba Tec, the technical support division. The nature of their work means that the division is widely dispersed, with technician's largely working solo in their own regional areas. 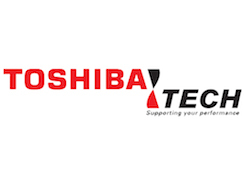 Toshiba chose to partner with Middlesex because of their extensive experience in developing bespoke training programmes. Together Middlesex and Toshiba Tech created a Positive Enquiry-based Level 5 Diploma in Changing Practice. It was designed to help participants align their personal goals with those of the company and better understand the drivers of Toshiba's corporate objectives and constraints. Middlesex's appointed in-house senior academic facilitated a session to enhance the knowledge transfer process. Participants were tasked to tackle their division's communications challenges using a work-based project approach. This provided a practical opportunity to learn how to take a leadership role, work innovatively as a team and drive through change. "Working with Middlesex University has been a refreshing experience. They make it feel natural and seamless to link the realms of academia and commercial activity. The work-based learning approach will have an on-going beneficial effect on our processes and decision making within the division." Mags Thomas, Senior HR Manager, Toshiba Tec.